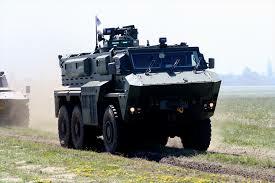 Mahindra Mine Protected Vehicle-I (MPV-I), is an Indian armored personnel carrier manufactured by Defense Land Systems, a joint-venture of Mahindra & Mahindra Limited and BAE Systems. MPV debuted in 2010, with the design aimed at protection of Indian security forces conducting anti-terrorism and anti-Naxalite operations in India's rugged forested and hilly terrains. It is powered by a ruggedized 230 HP diesel engine, paired with a 6x6 transmission. The MPV offers armored protection to its crew and passengers against ballistic and land mine threats. It uses a V-shaped hull of steel and monocoque construction to direct the force of the blast away from the occupants. It has been tested to protect against 7.62×51mm NATO, 7.62×39mm Soviet and 5.56×45mm NATO rounds from a 10m distance. It can withstand 21 kg of TNT equivalent explosions directly under any wheel, and 14 kg of TNT equivalent explosions directly under the crew compartment. It can carry up to 18 security and paramilitary personnel with full equipment including the crew. In August 2011, the first production series vehicles were delivered to Jharkhand Police. In October 2011, the CRPF reported that it had reduced the use of MPVs in operations against Naxalites, since some of the improvised explosive devices were of up to 80 kg, far above the 21 kg limit that the vehicles were designed to withstand.